How Do Hot Melt Adhesives Work ? With many new hot melt grades becoming available allowing formulations to be based on Polyamide, Polyurethane, Acrylic, Polyolefin, and EVA to give the user a greater choice of instant bonding adhesive technologies. 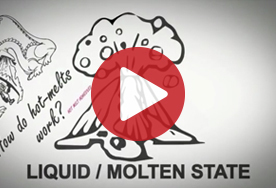 Our doodle video covers off points such as: What are hot melt adhesive made of, Why is compression important, Open time, Cold Bonds, Limitations of a hot melt adhesive and much more. Not sure which glue stick to use, try our Glue Selector and see what we can glue for you.